Good news: It will only cost you $11 a day. Personal finance blogger Jackie Beck doesn’t worry about emergencies. She has an emergency fund that will cover her expenses if she loses her job or has medical bills her insurance won’t cover. “I would think of an emergency fund as your debt-prevention fund,” Beck tells Better. Let’s say you lose your job. Paying your bills with a credit card will cost you more in the long run, she explains, whereas an emergency fund carries no interest. “It’s money that is there for the things that are going to happen in your life whether you want them to or not,” says Beck. The 49-year-old has learned the hard way — by getting herself into over $147,000 in debt. It started after high school, she says, when she started taking out credit cards which she used to pay for unexpected expenses. Think of an emergency fund as your debt-prevention fund. Beck says saving for emergencies and being frugal has helped her pay off her debt. She even created an app that makes paying off debt easier. According to the blogger, you can create a $1,000 “baby” emergency fund in 90 days. She recommends following these four steps to get started. The thought of saving $1,000 in 90 days may be daunting. But if you do the math, it comes out to just over $11 a day. Beck says many people waste that much money in a day without realizing it. You can figure out how to cut back, she says, by tracking your spending. “Tracking spending helps because it is so easy to spend money without realizing it and we don’t notice the things that we are spending money on,” she says. She recommends writing down what you buy on the back of the receipt, which will force you to think about how much you are spending and what you’re spending it on. Saving $1,000 in 90 days may be daunting, but if you do the math, it comes out to just over $11 a day. Beck says it also helps to look at your big budget items like cable to see if you’ve been wasting money. “A lot of people still have cable and maybe they don’t even watch the shows that are on cable,” she says. Online media sites like Netflix and Hulu might be better alternatives. If it is too difficult to save, there are other options, says Beck, like selling things you no longer use, or getting a second job. The best place to put your emergency fund is in a free savings account, according to Beck. She says many banks and credit unions offer them. She warns not to put the money in a checking account, where you’ll be tempted to spend it. “It should be ideally a separate savings account, and if the bank or credit union you’re at right now offers savings accounts too for free, that’s perfectly fine,” she says. Setting up daily, automated contributions from your checking account to your emergency savings account will make it easier for you to save, explains Beck. “It’s easier to save something that you’ve never seen in the first place,” she says. In this case, you would set up the automatic contribution to transfer $11.11 a day from your checking account to your emergency fund, she explains. At the end of 90 days, you should have $1,000 in your emergency fund. It’s important that you don’t look at your emergency fund as a way to make money, warns Beck. The fund has one purpose: to pay for specific emergencies. The blogger recommends making a list of things you consider real emergencies. For example, if you drive to work, you should consider putting car repairs on your list. If you live in an area prone to natural disasters, you might want to include money for evacuations. Everyone should save for unexpected medical expenses and potential job loss, she says, which will likely impact most people at some point in their lives. “It’s up to you, but the thing to remember: the more things your emergency fund needs to cover, the bigger it needs to be,” Beck says. 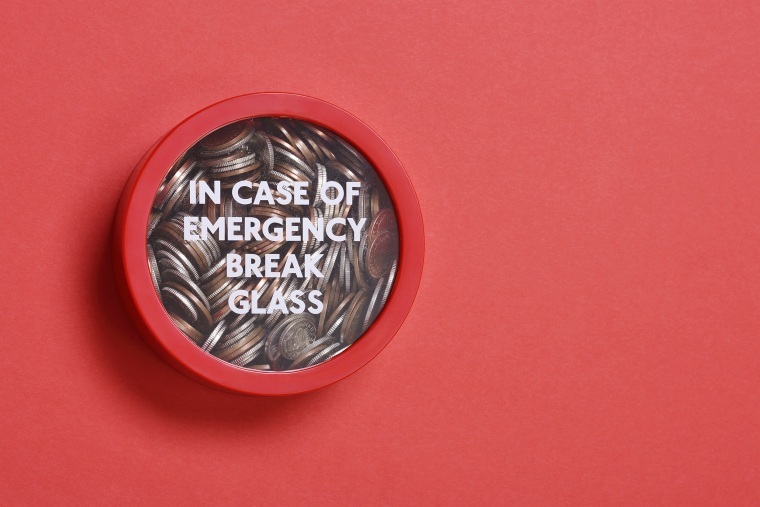 An emergency fund doesn’t just help you save: it reduces stress. Beck’s emergency fund, along with learning to live frugally, has helped her pay off her debt, she says. Step 1: Track your spending and figure out how much you need to save. To save $1,000 in 90 days, you’ll need to contribute $11.11 a day to your emergency fund. Pay careful attention to how much money you spend in a day and look into your big budget items to see how you can cut back. You can also get a second job or sell things around the house you don’t use. Step 2: Pick a place to park your emergency fund. Find a bank or credit union that offers free savings accounts and set up an account that is just for your emergency fund. Step 3: Set up daily, automated contributions from your checking account to your emergency fund savings. In this case, the automated payment will transfer $11.11 a day to your emergency fund savings account. At the end of 90 days, you’ll have $1,000 in your account. Step 4: Make a list of things you consider an emergency. It’s important to understand that an emergency fund is not a way for you to make money. Create a list of things you consider emergencies and only use the money for items on your list.